In the drawing, the dotted line represents the shape of the blank, and it will be somewhat different from the shape of the finished object. The process begins with gathering glass on the end of a metal blowpipe. This will become the cup of the goblet. The glass is marvered back and forth on the metal table, and gradually air is blown into the pipe. The bubble forms, and blowing and marvering simultaneously drives the bubble outward into the gather of glass. This gather must conform exactly to the shape of the inside of the dip mold. After the glass hardens, a little more is gathered onto the tip of this first gather. The soft glass is pushed firmly into the dip mold, the first gather acting as a plunger. The glass travels upward into the grooves. This is the process of mezza stampura. The pattern is decorated by pincering together pairs of ribs, and this will create the diamond pattern that we see. As this takes place, air is blown into the blowpipe, and the glass is gradually inflated. 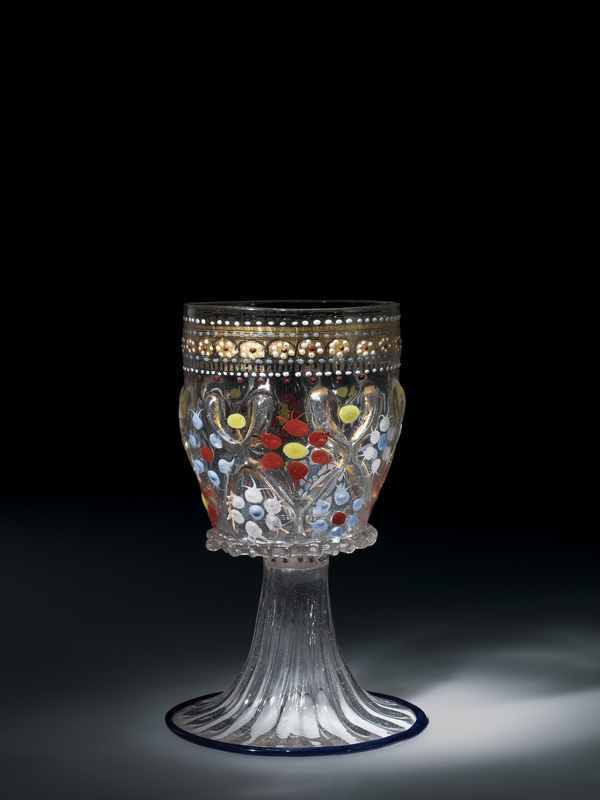 A constriction is formed between what will become the cup of the goblet and the blowpipe. Air is blown in, and the bubble travels outward into the decorated solid glass. Excess glass on the tip is trimmed away, and the neck or constriction near the blowpipe is completed. The cup is given its cylindrical shape; the bottom is made slightly conical. A trail of hot glass is added to the base edge and tooled. Next, the foot is made. This begins with another gather of glass on another blowpipe. The foot is decorated with straight dip-molding ribs. It is lowered into the mold, blown hard, and the ribs are formed. This is inflated and lowered into place on the bottom of the goblet. Centripetal force is used to elongate the foot to make the tall pedestal shape. A constriction is formed near the bottom. Here the excess glass will be broken free and a hole formed. A small gather of blue glass is trailed onto the edge of the foot and tooled to become a flat band. The glass is reheated, the soffietta (or puffer) is used to inflate the lower half of the bubble, and after reheating, the two-bladed tool called the jacks are used to give the foot its final shape. The punt (or punty) is attached to the bottom, and the vessel is broken free of its blowpipe. This is done by holding the constrictions with pincers and tapping the blowpipe against the rail of the bench. The edge is reheated, and after the glass softens, a special procedure is used to thin the lip. A constriction is made so that the thicker glass can be knocked off. 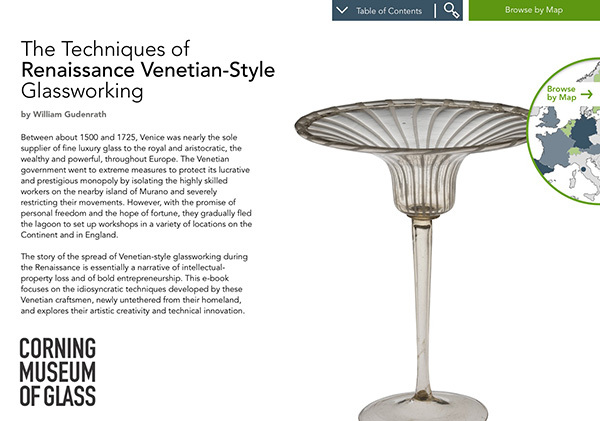 This is a way of achieving the thin edge that we see at this period of Venetian glass. The soffietta is used to further shape the bubble. The jacks are used to tool the edge to its final shape. The blank is broken free of the punty and annealed. The decoration process begins with making a mixture of gum arabic with water, and this is used as an adhesive and painted on the vessel. When the gum arabic slightly dries and becomes tacky, gold leaf is pressed gently onto the surface. This continues until the entire circumference is covered in gold leaf. After the gum arabic and water mixture dries, gold is scraped away to create a sharp edge at the top and bottom of the band, and decorative grooves are cut in with a sharp tool. Here, we see circular patterns cut into the gold. Here, we see toothlike (or denticulate) patterns cut into the gold. 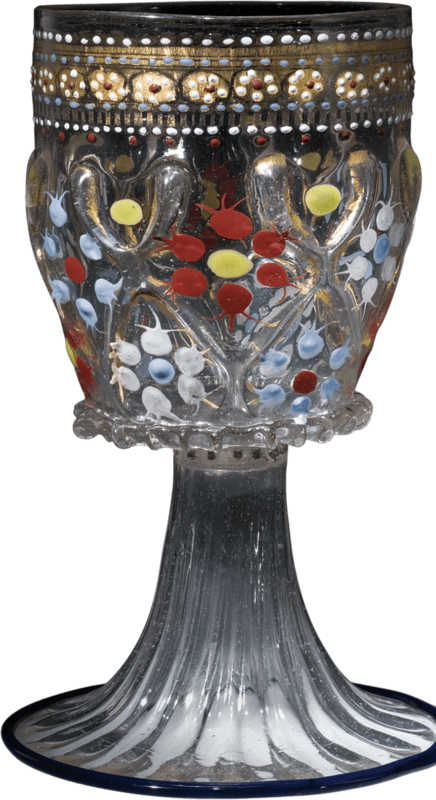 The enameling begins by grinding intensely colored glass finely in a mortar and pestle. The colored glass is mixed with gum arabic and water. The gum arabic acts as a binder. The mixture is left somewhat viscous and then painted onto the blank. The thick paint can be raked to form these lilies of the valley patterns. The paint is allowed to thoroughly dry. The decorated blank is placed in a cool annealing oven and gradually heated to a temperature of about 1000 degrees Fahrenheit. The punty is lowered in place, the vessel reattached and returned to the glassworking furnace. The glass is returned to the furnace again and again to the point that it becomes soft. When the glass thoroughly softens, shaping can be resumed. The cylindrical form is gradually transformed to the shape of a barrel. As the diameter increases, the cup becomes less tall. The finished object is broken free of the blowpipe and annealed yet again. Near the bottom of the cup, where the glass changed shape little, the dots changed shape little. But up near the rim, the greatest change of glass is revealed by a change in shape of the dots. They become oval. The interior is slightly irregular. The dots heat faster than the clear glass. The glass thickens under the dots. There’s also a double punty mark. There’s a punty mark from the making of the blank, and a punty mark from the decoration firing.